As a young man, Sunday leaves his home country of Nigeria to study journalism in Belarus, USSR. The Soviet government persuades international students to study socialism, cultivating skilled spokesman for their communistic ideology. Sunday however turns to God for his ideals. There is no religious freedom when Sunday arrives in the USSR. Despite all the threats and false accusations targeted against him, Sunday starts reaching out to the outcasts of society. This was the start of something that had never been seen before in the USSR. Fullscreen. Today Sunday is pastor to more than 20,000 believers and has started churches all over the world. More than 2,000 people are fed daily in the church's soup kitchen and another 3,000 have been set free from drug and alcohol addiction in the church's Rehabilitation Center. In this DVD Pastor Sunday shares the secrets of his heart and keys to his success. What a great production with first-rate editing, photography, and music! 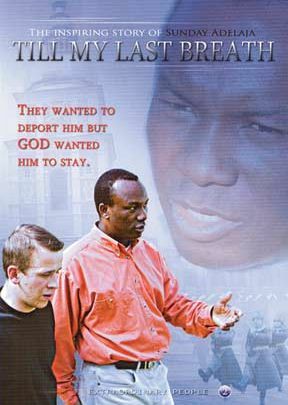 This documentary of Sunday Adelaja begins in 1986 when he leaves Nigeria to study journalism in Belarus, USSR. With the fall of Communism three years later, he accepts a position with a Kiev television station. After several months of fasting and prayers, he answers God’s call to start a church and begins with Bible study in his home. Ridiculed by the government, media, and Orthodox churches, the first people to come to his church were street people, alcoholics and drug addicts – the kind of people who felt comfortable around Jesus. Pastor Sunday urged them to stop fighting their addictions, to depend upon God to set them free. His church grew to 20,000 members, fed 2,000 people each day, with 40,000 people freed from addictions. Over 300 other churches have been planted in the former Soviet Union, as well as 30 other countries of the world. Pastor Sunday’s twenty-year story is truly amazing! Highly recommended for classes and discussion groups, junior high and up.